1) No other time in our history have we been exposed to this much information. The best way to make sense of it all is through statistics. Any Geospatial Analyst worth his salt will not only have a greater understanding of statistics, but can use this knowledge to predict future events. Through standard algorithms and probability equations (linear regression, Bayes’ Theorem, Chi-squared), GIS professionals should be able to anticipate incidents and recognize trends. Traditional statistics are often dismissed as an antiquated and difficult to understand method. The truth is people are afraid of what they don’t understand. Statistics in its many forms are a relatively easy way to understand and model data. 2) Without intimate knowledge of regional cultures, ideologies and traditions, a comprehensive answer can never be discovered. Data in its many forms can only paint a partial picture. Spend time to discover the truth that rests in the individuals responsible for establishing this information. 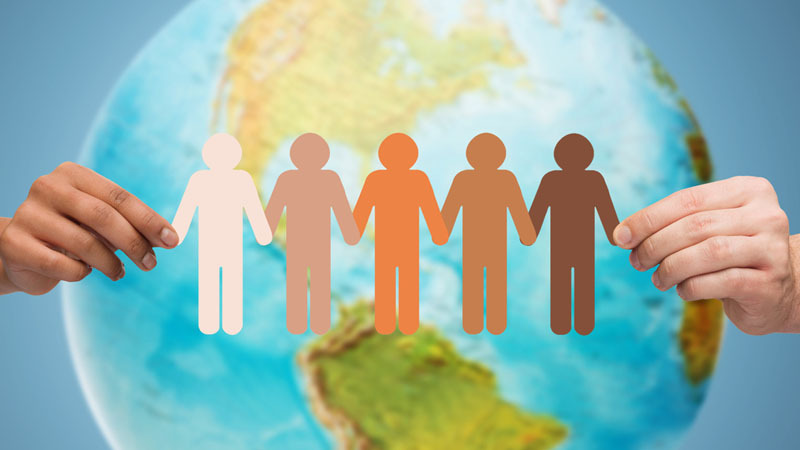 Human geography reveals many secrets that typically are hidden in the data. Why did the 2014 West African Ebola outbreak impact so many people? 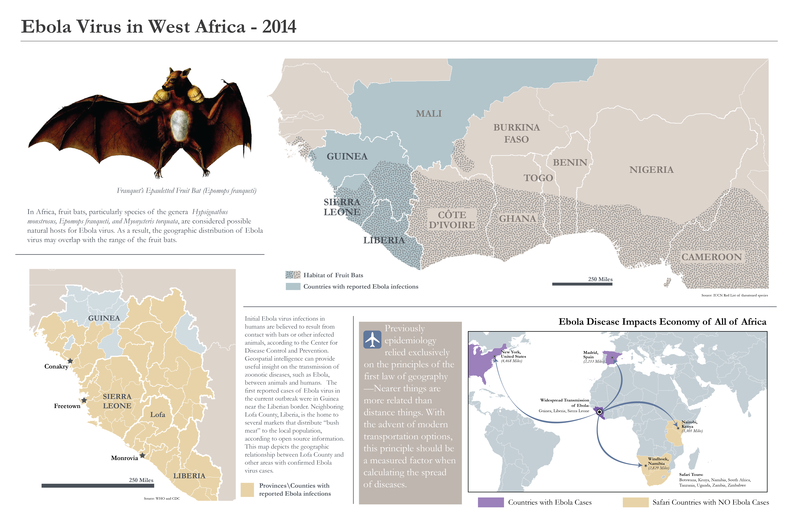 A greater understanding of the region would uncover that culture played a major role in the spread of the disease. Epidemiology models behavior and not the corruption and distrust of local governments. 3) Expand your knowledge of non-traditional data formats and GIS software programs. ArcGIS is a powerful comprehensive package that is capable of performing virtually any GIS function that exists. It is however extremely expensive and not very intuitive. It also uses an archaic file format (shapefile) that requires at least three separate files to form one geospatial entity. Learn some of the more contemporary file formats that are easily exchangeable between platforms and programs. GIS file formats such as GeoJSON and GML are becoming more and more popular and are based upon open standards accessible by all. Additionally if you really want to distance yourself from the crowd, spend some time learning about other software solutions that will scale to fit your needs. Some examples include: CartoDB, MapBox or QGIS. 4) Learn how to visualize your comprehensive analysis in an appealing unambiguous way. Many GIS software programs do not have the capability to present analytical results that influence the audience. I’ve seen too many maps that are just plain ugly. Learn that through the use of subtlety, your message will be received and results will follow. Harsh coloring without the knowledge of simple tint dynamics will turn most people off. Recognize that deep dark coloring is very unappealing and shows ignorance of visualization standards. Research best visualization practices (i.e. infographics) to discover how best to convey your results. Learn how to use graphics programs like Adobe Illustrator to take your analysis to the next and final step. 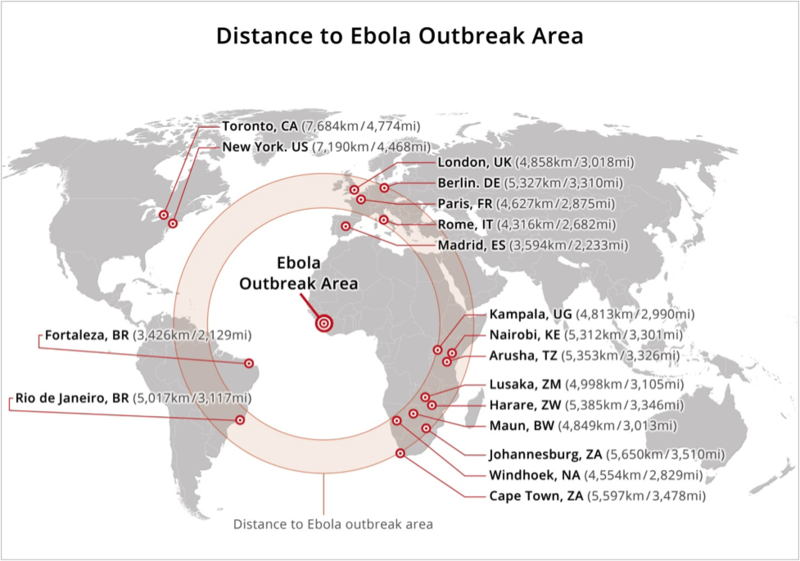 5) Get back to the fundamentals and recognize that geography is the core. This field of science has many different sub disciplines that help shape an understanding of the subject you’re analyzing. Learn what they are and apply them. Geospatial analysis is all about relationships. Use the principles of Tobler’s Law to guide you through your results. Any good geospatial analyst will recognize that a holistic approach is the best way to find the answer you’re searching for. Although NGA (National Geospatial-Intelligence Agency) is America’s youngest intelligence agency, it has surprisingly old roots: one organization sometimes claimed as a predecessor is the Union Balloon Corps, 1861-1863. It’s a common belief in our profession that the American Civil War saw the first use of military observation balloons. It’s also sometimes held that aerial photographs first proved themselves valuable sources of military intelligence. I hadn’t thought much about this “common wisdom” until a colleague challenged me to prove it. While balloons were used for observational purposes during the Civil War, this was not their first appearance. 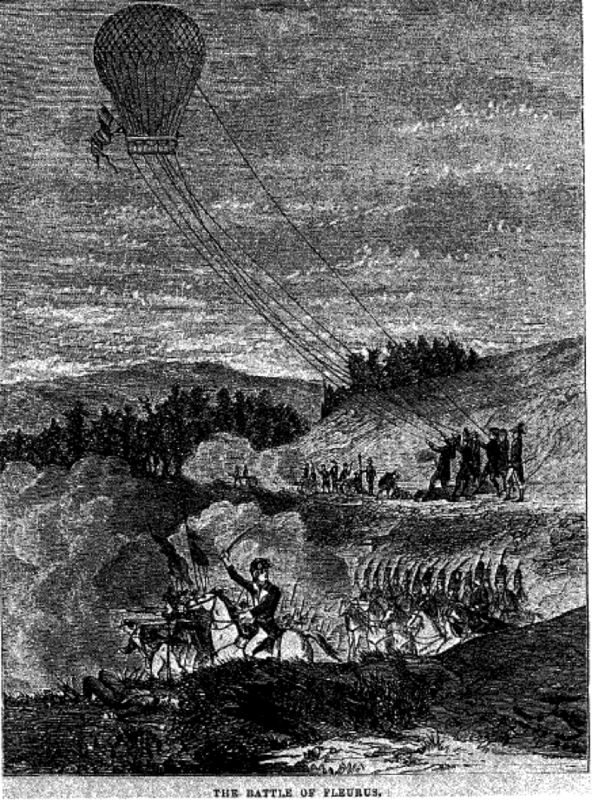 Almost seventy years before (June 1794) the French army pioneered the use of balloon reconnaissance at the battle of Fleurus. 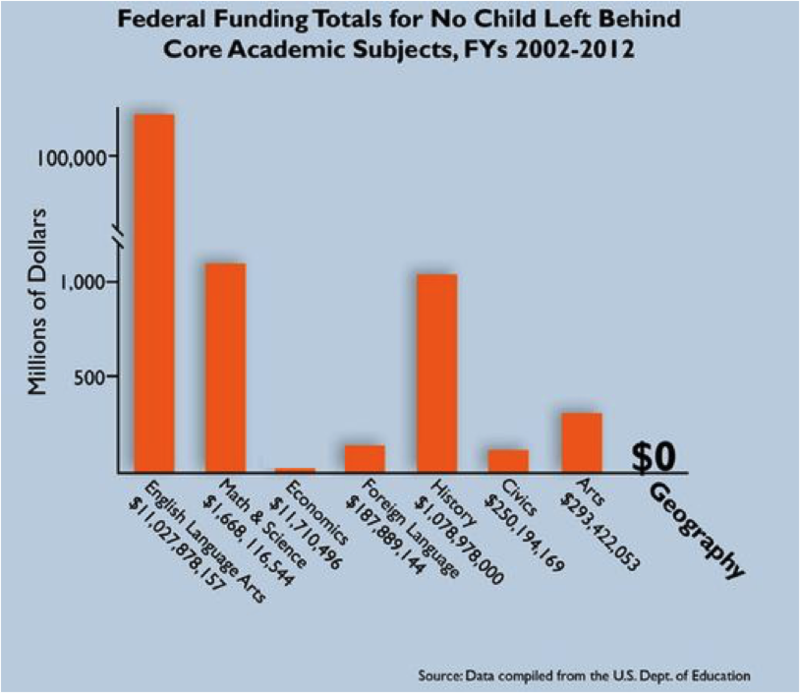 (Figure from Wise). There is no evidence for the use of balloons as aerial photography platforms during the Civil War. Hand-drawn maps were, however, created by observers aboard balloons. 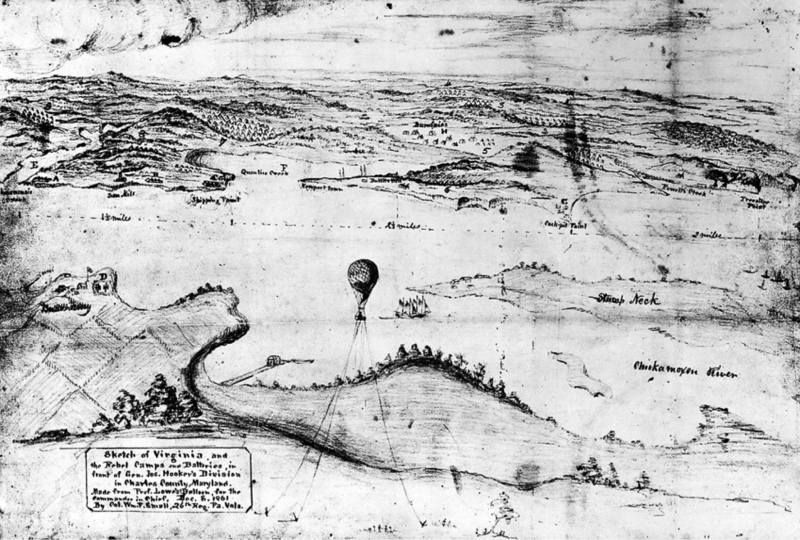 The below map of Virginia was drawn by a balloon observer. (From Smithsonian Institution). Aerial photography probably didn’t occur until much later than the Civil War. 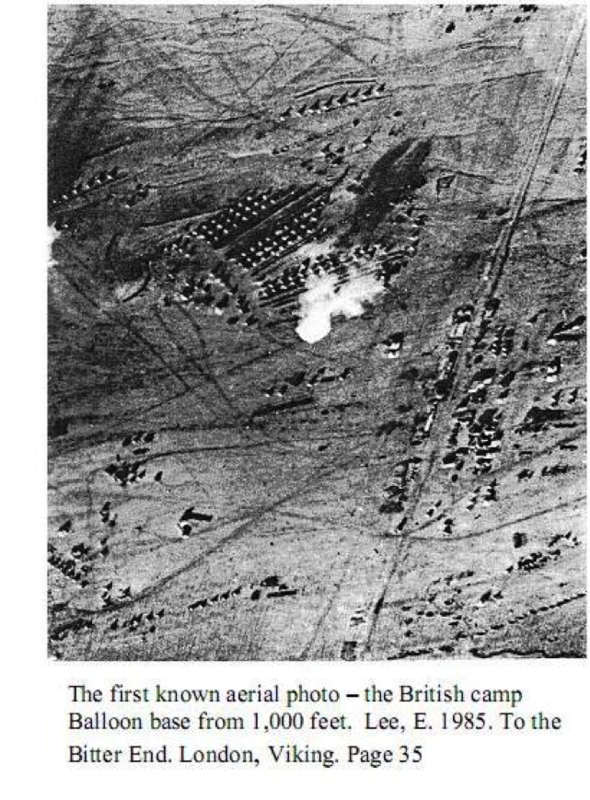 The first known military aerial photo was taken at the relief of Ladysmith, during the Boer War. Of course, absence of proof is not proof of absence. Perhaps the photographs were taken, but lost over time, much like the pioneering work described later? This hypothesis is feasible, but since ground photos of balloons and hand maps drawn by balloon-based observers have survived, why wouldn’t the valuable air photos be preserved? Likewise, we do have records of an unsuccessful attempt at taking photos from a balloon, so why are there no records of successful attempts? And if, as a recent manuscript stated, balloon photography proved an excellent military tool, why are there no surviving intelligence products? Or even mentions of them in the accounts written by military commanders? 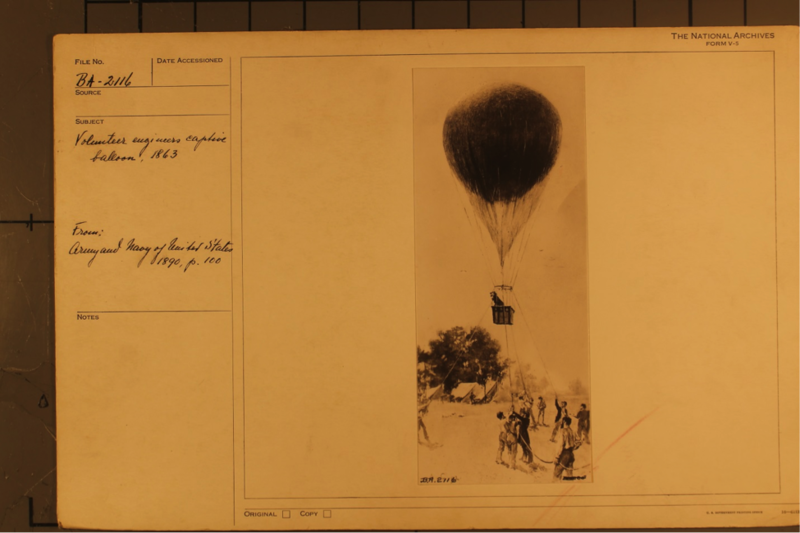 Even the officers who lauded the value of balloon reconnaissance, such as Union Army Commander General George McClelland, failed to mention photos. The Air Force Historical Studies Office referenced Crouch in their reply. 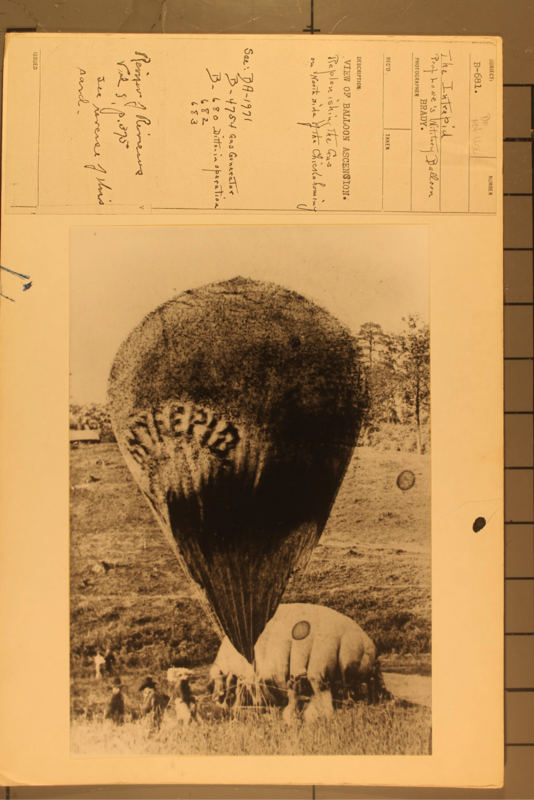 The U. S. Army Center of Military History also confirmed the absence of balloon photos from that period, adding that the earliest mention of Army aerial photography they could find was taken in 1909—from an airplane. If the experts agree that they don’t exist, why do so many people in our community believe in the existence of these mythical Civil War air photos? Partly, this is a rational assumption—the technology existed at the time, so why wouldn’t they make use of it? (This points out a paradigm shift discussed later. The main reason, however, is simply the fact that we’ve all heard it, from so many sources, some of whom should clearly be “in the know” about such things. There’s a natural tendency for humans to believe stories, and pass them on, if they hear them often. The “crowd sourcing” of information in social media relies upon the assumption that the majority view is likely to be correct. Even discounting the use of photography, did reconnaissance balloons prove to be valuable intelligence assets? Although the value of a mobile, incredibly tall watch tower would seem to be undeniable, the answer is still in dispute. Although some commanders lauded the new technology (ref), others were more critical. The largest effort, Thaddeus Lowe’s Union Balloon Corps, served during the Peninsular Campaign (1862), which is famous for absolutely abysmal military intelligence of the Union Army. Its commander, General McClellan, was convinced he was outnumbered (he actually had a substantial edge in numbers and quality) and retreated after every Union victory. The presence of balloons failed to reveal that the Confederate defensive lines at Yorktown were manned by a few soldiers feigning activities, or that many of the “artillery” were actually “Quaker guns”–logs that had been painted to resemble cannon barrels. This is an early example of “spoofing” being used against aerial reconnaissance. And the most telling evidence questioning the value of balloons? The Union Balloon Corps was disbanded in 1863, well before the end of the war. So while the balloons may (or may not) have been of value, they certainly didn’t “prove” it to most of the Army. This leads us to the question: why didn’t anyone take air photos from balloons? The technology certainly was available. 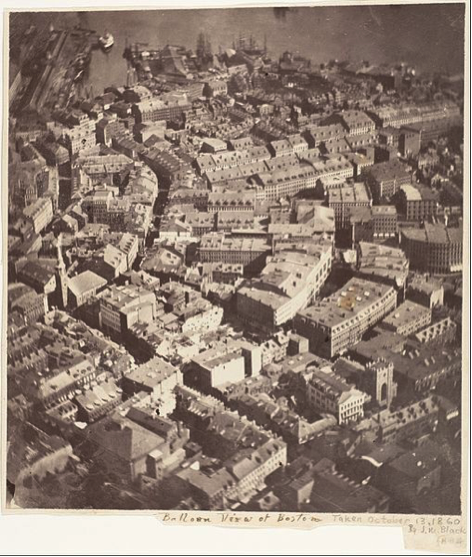 French pioneer Gaspard-Felix Tournachon (better known as “Nadar”) became the first person to take aerial photographs in 1858, but none have endured; the first photo that actually survived was taken by James Wallace Black and Samuel Archer King in 1860 (see above image). 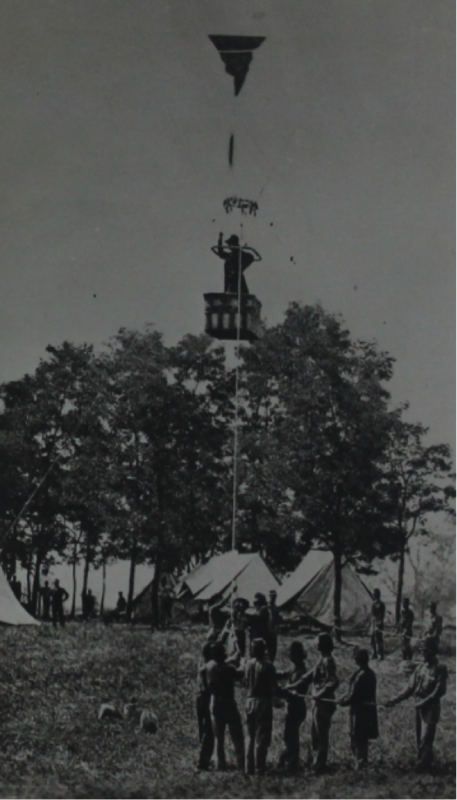 The founder of the Union Balloon Corps, Thaddeus Lowe, clearly planned to take such pictures and attempts were made at least once (In July, 1862, James Allen of the Union Balloon Corps took some photographers up, but strong winds intervened). Given the apparent obvious advantages of air photos, why didn’t this happen? Crouch believes that primary reason is “the fact that contemporary photographs probably did not offer the resolution over a range of distances, or the level of detail required from aerial reconnaissance.” This is just one limitation to the technology of the times, however. Early photography was a complex discipline requiring a substantial amount of skill. Unlike Nadar, who was a photographer before he was a balloonist, there is no reason to believe that any of the Civil War aeronauts had this skill. The tripod-mounted cameras of the time were bulky and awkward, and would have been difficult to handle aboard the small balloon gondolas. More telling, they required very long exposure times—5 to 30 seconds, or longer. The swaying motions of balloons would obviously have major effects at this speed. Indeed, the slow exposures explains why no action photograph was ever taken during the war. But the most serious limitation had to do with the nature of the photographic medium—a glass plate, which had to be prepared with chemicals just moments before being inserted into an already aimed and focused camera. Once the exposure was complete, the plate would have to be immediately developed. Since these activities had to take place in absolute darkness, a portable darkroom had to accompany the photographer. One of Lowe’s balloons ascending, showing small basket barely capable of holding one man. No space for a darkroom here! 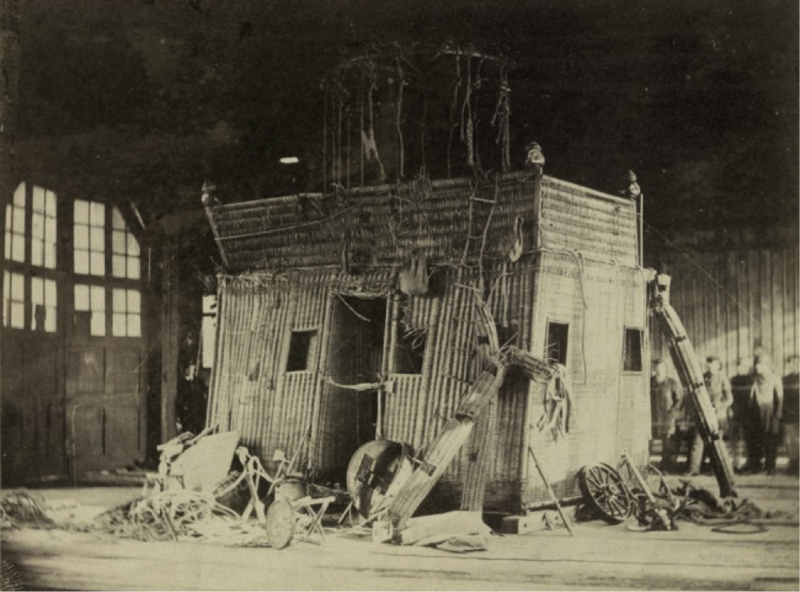 This explains the size of Nadar’s gondola: it had to contain a dark room. (It also carried paying passengers). The two-story structure require a truly enormous balloon to lift in—one of Nadar’s designs contained 210,000 cubic feet. Lowe’s tiny observation baskets were clearly too small to contain a darkroom, and the balloons in use couldn’t have lifted one anyway. 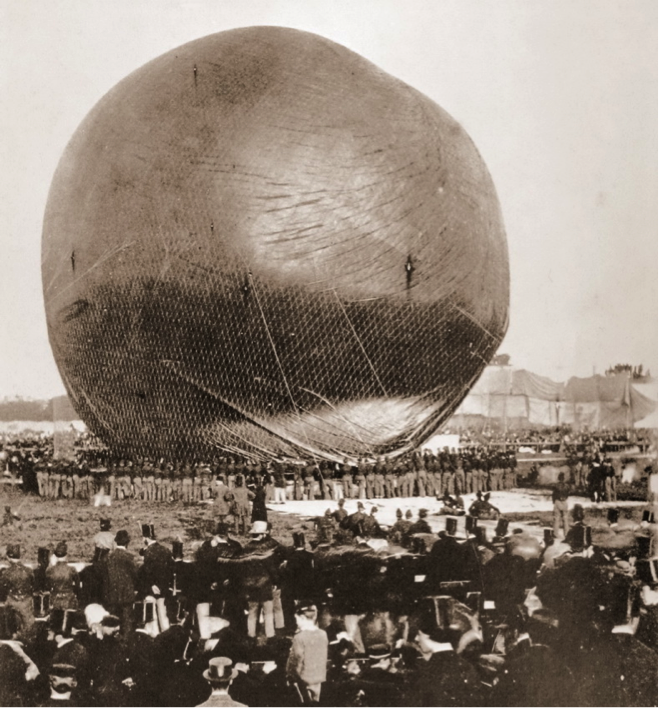 Lowe’s smallest balloon was less than a tenth the size of Nadar’s behemoth, and his largest, Intrepid, only contained 32,000 cubic feet of hydrogen gas. The Intrepid, one of Lowe’s balloons. Note relatively small size. Photography would not have fit the operational tempo, anyway. With the exception of sieges such as Petersburg and Vicksburg, most Civil War combat was pretty mobile. The armies were constantly on the march, and by the time a photograph was brought down to the ground and transported by courier to headquarters, the enemy would have been long gone. In contrast, an observer could telegraph a few key observations to headquarters in real time, a far more efficient system. The fact that we frame this question as, “why didn’t they”, shows how much our thinking has changed since then. Denizens of the time probably would have asked, “Why would they?”. The ubiquity of overhead imagery now guarantees that we all pretty much see its value. In the 1860s, most people were unfamiliar with photography, and would not immediately assume it was useful. There was no NPIC (National Photographic Intelligence Center), no team of trained imagery analysts, to interpret the photographs. 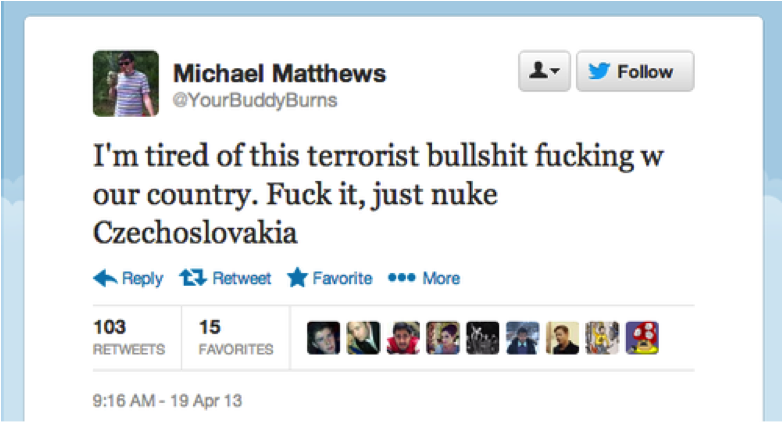 And from a military intelligence perspective, its value at the time is questionable. Early air photos were usually shot looking straight down. Since balloons were tethered behind the lines, this would not have revealed much. Shooting out would have been a requirement, and there were no cameras with zoom lenses yet—they were all optimized for portraits. What would a photo, shot from a balloon moored behind, the lines, at extreme oblique angles, even have added? Blurred images of tiny antlike soldiers, uniforms unrecognizable (not that Confederate were very uniform anyway), marching in lines? 1st air encounter. At one point both Union and Confederate balloons were in the air. 1st artillery observer. Balloons were used to adjust artillery fire. 1st aircraft carrier. 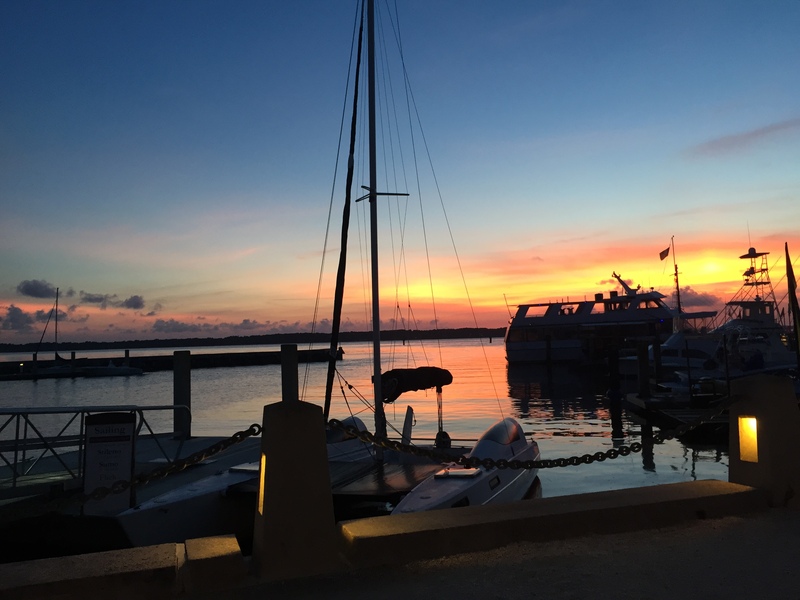 Balloons were launched from boats (see below). 1st conflict between science and military. Lowe and his aeronauts were frequently in dispute with Union officers such as Lt. George Armstrong Custer, who felt that only military-trained men would make proper observers. Military leaders didn’t trust the balloon aeronauts’ reports. Custer, who served as a military balloon observer, later revealed a widespread army belief that “it was to the interest of the aeronauts to magnify their statements and render their own importance greater, thereby insuring themselves what might be profitable employment” (Jarrow). 1st problems with aeronautical contractors. The military frequently clashed with the aeronauts. When Captain C. B. Comstock of the U. S. Army Corps of Engineers gained oversight, he cut Thaddeus Lowe’s salary by 70%; Lowe ended up resigning. 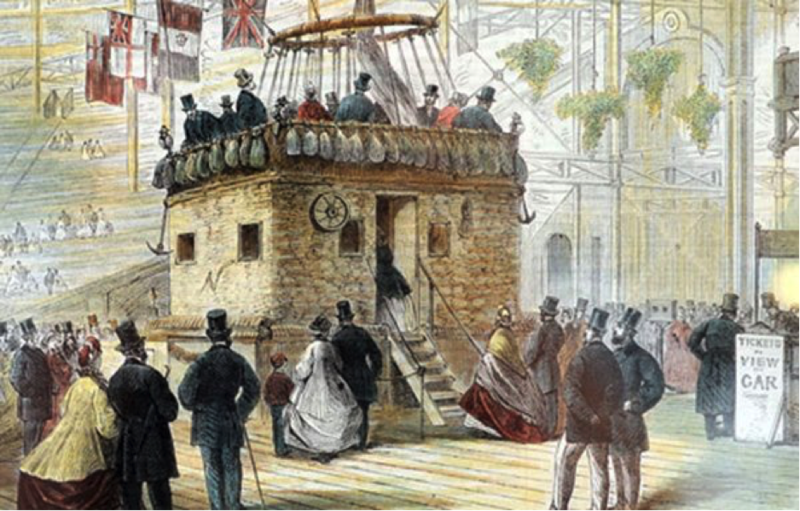 Several aeronauts claimed to have never received full compensation from the government. And the entire program ended up being cancelled in 1863. The first aircraft carrier. 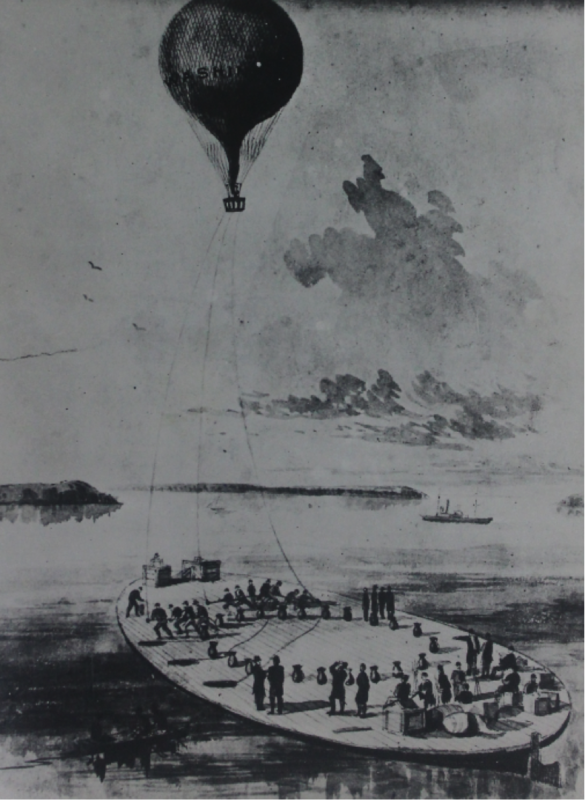 The Union’s “balloon-boat”, the George Washington Parke Custis, launching the balloon Washington. So, while it makes a powerful and pithy statement to say that the Union Balloon Corps was an early predecessor, calling it “America’s First NGA” is a stretch. In reality, the Union Balloon Corps; only real connection to GEOINT being a few hand-drawn maps. It can, however, claim to be America’s first Air Force. One lesson that can be learned from my experience, is that even the most widely believed “common knowledge” can prove to be wrong. All assumptions, no matter how basic, need to be challenged from time to time. There’s no excuse for a scholar failing to research his topic adequately. Air Force Historical Studies Office, private correspondence, June 4, 2015. Crouch, Tom, Senior Curator, National Air and Space Museum Smithsonian Institution, private correspondence April 20, 2015. Crouch, T. D., Eagles Aloft: Two Centuries of the Balloon in America, Smithsonian Institution Press, 1983. Crouch, T. D., Lighter than Air: An Illustrated History of Balloons and Airships, Johns Hopkins University Press, Baltimore, 2009. Davis, C. W. and B. L. Wiley, the National Historic Society, Civil War Complete Photographic History, Tess Press, New York, 2000. Dupuy R. E. and T. N. Dupuy, The Encyclopedia of Military History, Harper and Row, New York, 1970. Evans, C. M., War of the Aeronauts, A history of Ballooning in the Civil War, Stackpoole Books, Mechanicsburg, 2002. Haydon, S., Aeronautics in the Union and Confederate Armies with a Survey of Military Aeronautics Prior to 1861 Vol. 1, Johns Hopkins University Press, Baltimore, 1941. Historical Resources Branch, U. S. Army Center of Military History, private correspondence, June 22, 2015. Jarrow, G.Thaddeus Lowe and the Civil War Balloon Corps, Boyds Mills Press, Honesdale, 2010. Lee, E., To the Bitter End, Viking, London, 1985. Knauer, E., Ed., The Civil War: An Illustrated History, Time Books, New York, 2011. War Department, The War of the Rebellion: A Compilation of the Official Records of the Union and Confederate Armies, Government Printing Office, Washington, 1884. Wise, J., Through the Air: Forty Years Experience as an Aeronaut, To0day Printing, New York, 1873. During the spring of 1945, as Allied forces closed in on Berlin, members of a special U.S. military unit discovered a large cache of geodetic material in a remote warehouse in Saalfeld, Germany. These archives contained almost complete coverage of all orders of geodetic control data for the German occupied areas of Europe, 95 percent of which had not been previously available to the Allies. Weighing in at just over 90 tons, it is considered to be the largest coup in the history of geodesy. A special unit of the military intelligence division, Office of the Chief Engineers (OCE), operated in the European theater from October 1944 to September 1945. Its mission was the exploitation of targets for the procurement of geodetic control and maps. The team was known as the HOUGHTEAM, named after their scholarly leader, U.S. Army Major Floyd W. Hough. The complement consisted of three commissioned officers, four engineer consultants and 10 enlisted men. The HOUGHTEAM operated freely throughout the European Theatre of Operation (ETO) and had no Table of Operations and Equipment (TO&E), nor was it attached to any Army group. Early in the year 1944, it became evident to OCE that a significant deficiency existed in the holdings of geodetic horizontal and vertical control, as well as source materials required for military mapping operations. This deficit was specific to Europe, especially the Balkans. Much of Europe had no geodetic data publicly available except that of first-order control, which was entirely too sparse to serve the needs of adequate, large-scale topographic mapping required in ETO. In every country, thousands of such known geodetic points exist and are normally documented by the national mapping agencies. In geodesy and surveying, a control network, or simply control, is a set of reference points of known geospatial coordinates. The higher-order (first order) control points are normally defined in both space and time using global or space techniques, and are used for “lower-order” points to be tied into. The lower-order control points (second and third) are normally used for engineering, construction and navigation. The scientific discipline that deals with establishing the coordinates of points in a high-order control network is called geodesy, and the technical discipline that does the same for points in a low-order control network is called surveying. Classically, a control is divided into horizontal (X-Y) and vertical (Z) controls (components of the control); however, with the advent of satellite navigation systems, GPS in particular, this division is becoming obsolete. In September 1944, Hough, chief of the geodetic branch, military intelligence division, OCE, was directed to organize the team and to proceed without delay to ETO. October 23, 1944, the HOUGHTEAM arrived in Paris. An office was quickly established in that city and research work started among the various local libraries. Portions of the team operated on the battlefront in such locations as Germany and France, with arrival time on the day that it was being cleared of enemy troops. At various times during this period, other portions of the team were sent for geodetic and map research work to such places in the ETO as Lyon, Marseille, Rome, Pisa, Florence, Foggia, Naples, Lisbon, and Brussels. In the spring of 1945, the HOUGHTEAM picked up and relocated into Germany, arriving in Frankfurt March 29. 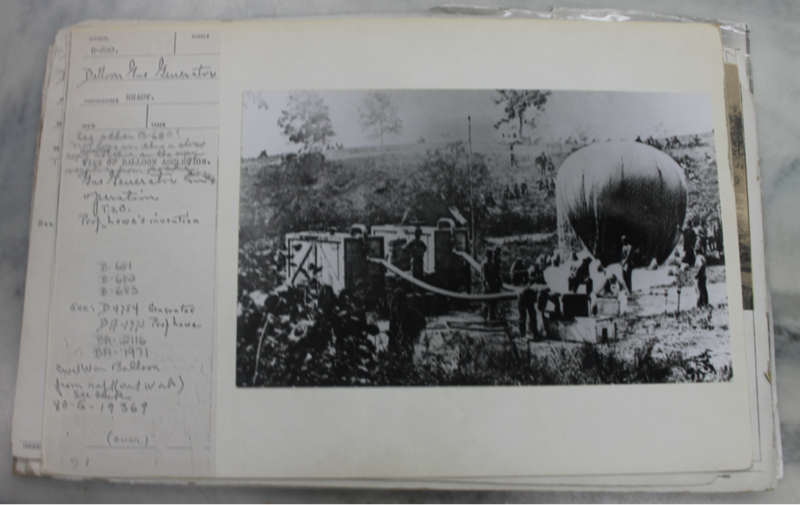 In the five months since its formation, the HOUGHTEAM produced a large amount of captured geodetic material vital to the artillery for the provinces of Baden-Baden, Württemberg and Bavaria. During World War II, artillery batteries typically employed “indirect fire” techniques, whereby the firing equipment was aimed without seeing the target through its sights. Precise distance measurements were paramount for this type of technique to be effective. The HOUGHTEAM’s data captures were rushed directly to the survey officers of the third and seventh armies, in time for use by their artillery units in battle. Rumors began floating around that the Germans had captured significant amounts of Russian geodetic data. The collection was being stored someplace in Germany; however, the captured German soldiers were not talking. By chance, a conversation was overheard inside a hospital that was treating wounded German soldiers. In this conversation, one of the HOUGHTEAM members learned about a cache of data and materials in the remote village of Saalfeld, Germany. The entire geodetic archives of the German army were finally located in a remote warehouse in Saalfeld April 17. Up to 75 truckloads of geodetic data, maps and hand instruments were found. It quickly became apparent to the HOUGHTEAM that they needed some serious help moving all of the materials back to the town of Bamberg. They asked the local artillery unit to assist by providing trucks, and recent German POWs provided the man power. The HOUGHTEAM was also concerned with the advance of Russian troops pushing in from the West. Saalfeld was to be handed over to the Russians as part of their “Zone of Occupation.” Hough knew that the Russians wouldn’t let him keep the rich haul that the HOUGHTEAM discovered. He also feared that they would soon learn that this cache existed and search the entire town for their captured material. Fearing the worst, Hough wrote an expeditious letter to the Chief of Staff, VIII Corps, stating that “in the city of Saalfeld…military personnel is entirely inadequate to cope with the situation which may arrive at any time”(Image 2). In addition to acquiring mapping and geodetic materials, the HOUGHTEAM captured internal mapping agency chiefs who were instrumental in helping the U.S. discover hidden caches. Additionally, the team learned about the leadership hierarchy of the Kriegakarthauptamt, or the War Mapping and Surveying of the German Army. 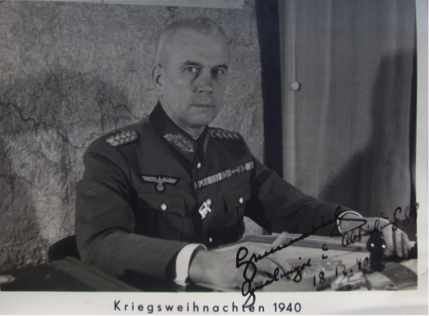 Two prominent members of this organization were located and interrogated by Shallenberger: Colonel Klinkowstroem, assistant chief, and Lieutenant General Gerlach Hemmerich, head of the Kriegakarthauptamt. During the interrogation of Colonel Klinkowstroem, Shallenberger, the lead interrogator, ascertained that the Germans were performing geodetic preparatory work (third-order surveying) for the areas over Romania, Hungary, Croatia, Slovakia and Bulgaria.This indicated their potential plans for the expansion of German settlements on the Balkan Peninsula. One interrogation that occurred later than expected was for Lieutenant General Gerlach Hemmerich. After the German army’s surrender on May 7, 1945, many leaders were quickly marshaled and debriefed. However, the general was nowhere to be found. It wasn’t until four months later that his location was finally discovered. On September 15, 1945, Shallenberger was checking into the addresses and homes of former employees of the Deutsche Bank, of which Hemmerich was a director. Initial analysis revealed that general’s home had been taken over as Army quarters; however, he decided to visit the residence on a hunch. Upon arrival, he questioned the female cook and noted that she spoke in pure German, usually only used by highly educated Germans. After intense questioning, he determined that the cook was indeed Frau Hemmerich, wife of the general. She said the general had just started a new job, stoking furnaces for the Americans. He was immediately placed under arrest when he arrived home from work. The general told Shallenberger that he had expected arrest for the past four months. On top of the capture of several leaders, the Army also netted a number of prominent German geodesists. Among those captured was Erwin Gigas, internationally known chief geodesist of the Reich Office of Recording. Along with his staff and equipment, Gigas was moved to Bamberg, in the U.S. zone of occupation. There, he was instructed to perform least-squares adjustment of a selected network of first-order triangulation, extending over 300,000 square miles of Europe using the HOUGHTEAM’s captured geodetic data. The least-squares adjustment uses all the measurement data, together with control points, to estimate the most probable coordinate for every point in the geodetic network. This was all made possible because each individual country had already performed its own first-order geodetic survey, dictated by national pride of sovereignty. 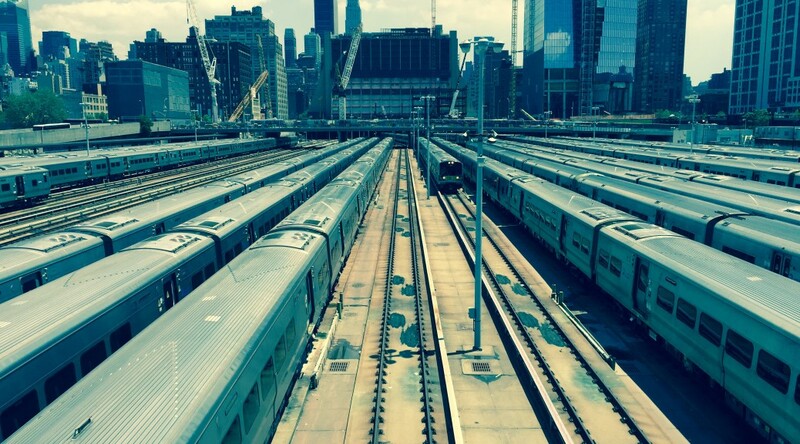 Each datum was typically calculated in the respective country’s capital by establishing an astronomical fix for one station. Tying together all of these individual geodetic networks in the frontier would prove to be a difficult task; a comprehensive project of this type for all of Europe had never before been possible. 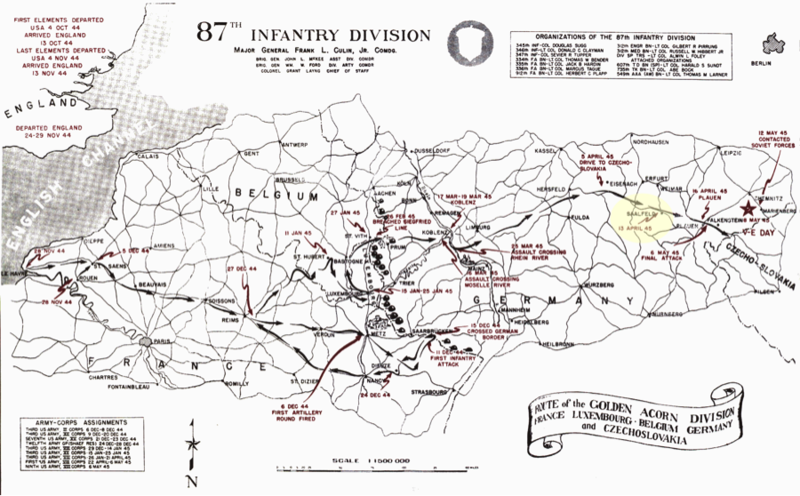 This work, under the technical supervision of the Army Map Service, was finally completed in June 1951. The resulting datum is known as the European Datum of 1950, or ED50. It governs all of continental Europe west of 30° East longitude and is computed on the International Ellipsoid. It still is used in much of western Europe, apart from Great Britain, Ireland, Sweden and Switzerland, which have their own datums. During the summer of 1945 at Bamberg, the HOUGHTEAM directed the chief magnetition of the German army to prepare a magnetic atlas of Europe based on a common epoch of 1944-45. This atlas was published by the Army Map Service in 1950. Obtained complete geodetic data coverage of four provinces of Germany, discovered in the combat area, delivered direct to the artillery and put into an immediate operational use at the front. Geodetic and cartographic library reference books on all countries in Europe. 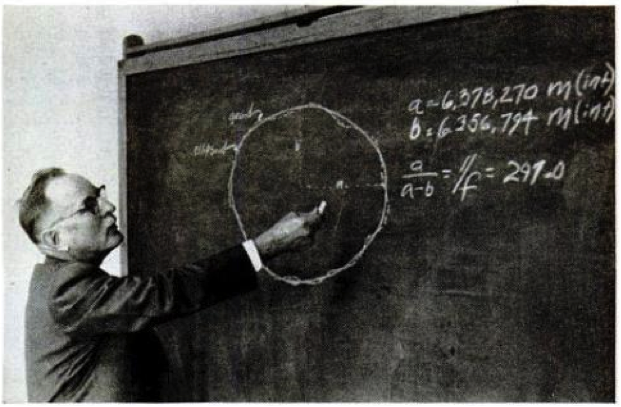 Acquisition of a nucleus of German geodesists and mathematicians and their removal to the United States Area of Occupation for use on scientific projects by U.S. forces. Technical supervision of the adjustment of European first-order triangulation to a common geodetic datum, ED50. The compilation of the magnetic atlas of Europe, epoch 1944-45, published in 1950 by the Army Map Service. Following the war, Floyd Hough continued on with the Army Map Service, helping develop many other geodetic and mapping projects. One of the more important projects in which he was directly involved was the creation of the Universal Transverse Mercator (UTM) grid, a worldwide plane coordinate system developed in the 1940s by the U.S. Army’s Corps of Engineers. This coordinate system is the father of the current reference system currently in use by the U.S. Armed Forces and NATO, the Military Grid Reference System (MGRS). One of Hough’s more ambitious projects was called the “Figure of the Earth” program. For 14 months in the early 1950s, members of the Army Map Service slowly worked their way across a desolate, 600-mile stretch of Africa. Their goal was to determine the exact size of the Earth and measure precise distances over its curved surface. They chose this remote stretch of land along the 30th meridian because it was the only stretch of land along this line of longitude that had never been measured. Previous measurements along its length had been done in other parts of Africa and Europe. By measuring the entire distance of the 30th meridian, the team would create an excellent “yardstick” to measure the size of the Earth as a whole. They knew that the 30th meridian traverses an exceptionally large amount of land from South Africa up to Norway. Armed with this information, the U.S. would know the exact distance between points across the Earth. These measurements would be paramount in the days of the upcoming missile era. Soon after the end of the war, civilian mapping agencies in the U.S. showed great interest in the newly discovered mapping and photogrammetric techniques in Germany. During the 1940s and 1950s, several papers were written discussing the German instruments and methods. It was well known that German and Swiss optical and precision mapping-related hardware were of the highest quality. Floyd W. Hough was awarded the Legion of Merit and the exceptional Civilian Service awards by the U.S. Army in 1957. Clarke, K. C., & John, C. G. (2000). On the Origins of Analytical Cartography. Cartography and Geographic Information Science, 195-204. Dille, J. (1958, May 12). The missile-era race to chart the earth. Life, pp. 124-138. Fischer, I. K. (2005). Geodesy? What’s That? : My Personal Involvement in the Age-Old Quest for the Size and Shape of the Earth. Bloomington: iUniverse. Hough, F. W. (1945, April 20). Letter to Chief of Staff, VIII Corps. Saalfeld, Germany. Hough, F. W. (1945). Materials moved to Bamberg. Hough, F. W. (1950). HOUGHTEAM. Bethesda: U.S. Army Map Service. Hough, F. W. (1951). International Cooperation on a Geodetic Project. EOS, Transaction: American Geophysical Union, 106-109. Kendall, A. (1945, July 21). 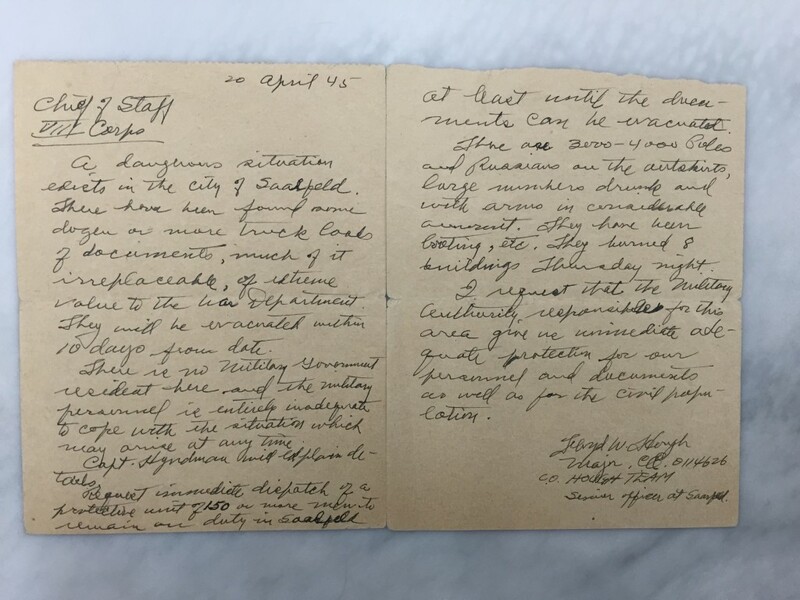 Letter to Floyd Hough from Chief of Engineers,War Department. Washington, DC. Shallenberger, M. (1945). Interrogation of PW Klinkowstroem. Bethesda: U.S. Army Map Service. Shallenberger, M. (1945). Report on Vatican Library. Bethesda: U.S. Army Map Service. Staff Writer. (1945, September 24). Nazi General found stoking U.S. furnaces, wife a cook. Stars & Stripes. 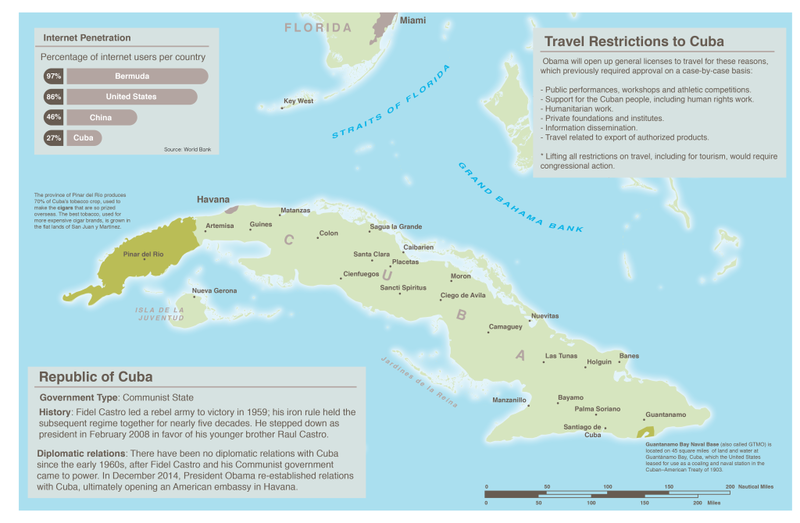 On December 17th, President Obama ordered the full restoration of diplomatic relationships with Cuba. “We will end an outdated approach that for decades has failed to advance our interests, and instead we will begin to normalize relations between our two countries,” Mr. Obama said in a nationally televised statement from the White House. 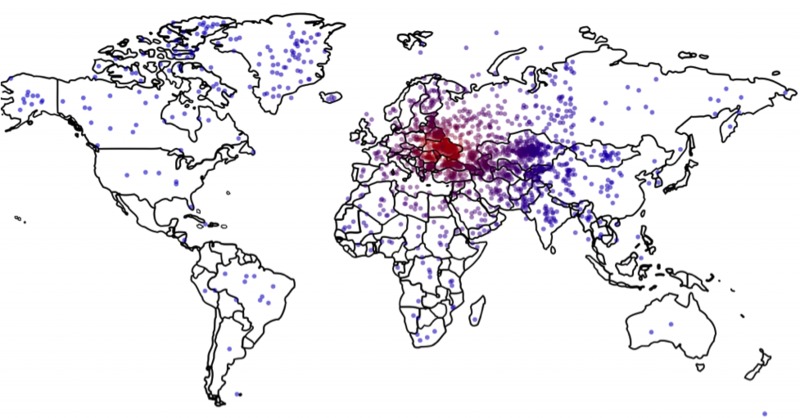 So what do we really know about our neighbors to the south? Well for starters the Castro regime has limited access to information for the majority of its citizens. According to conversations between Obama and Raul Castro, Cuba will allow more internet access. Although granting more access to information will allow the population to see how the rest of the world lives. Perhaps we may have a front seat to a Caribbean version of an Arab Spring? 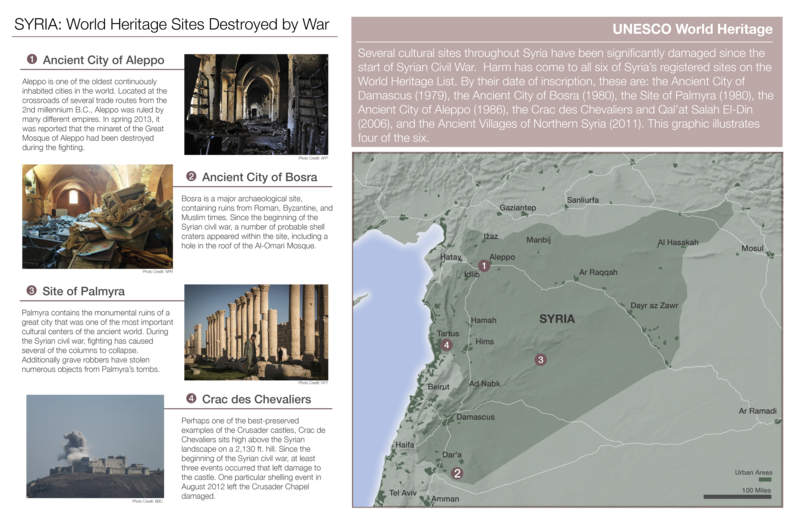 Several cultural sites throughout Syria have been significantly damaged since the start of Syrian Civil War. 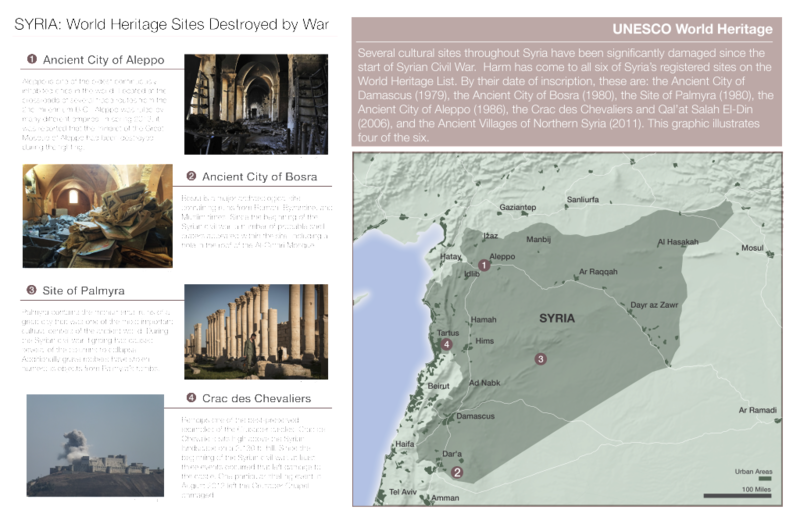 Harm has come to all six of Syria’s registered sites on the UNESCO’s World Heritage List. By their date of inscription, these are: the Ancient City of Damascus (1979), the Ancient City of Bosra (1980), the Site of Palmyra (1980), the Ancient City of Aleppo (1986), the Crac des Chevaliers and Qal’at Salah El-Din (2006), and the Ancient Villages of Northern Syria (2011). This graphic illustrates four of the six. Perhaps one of the best-preserved examples of the Crusader castles, Crac de Chevaliers sits high above the Syrian landscape on a 2,130 ft. hill. Since the beginning of the Syrian civil war, at least three events occurred that left damage to the castle. One particular shelling event in August 2012 left the Crusader Chapel damaged. Bosra is a major archaeological site, containing ruins from Roman, Byzantine, and Muslim times. Since the beginning of the Syrian civil war, a number of probable shell craters appeared within the site, including a hole in the roof of the Al-Omari Mosque. Aleppo is one of the oldest continuously inhabited cities in the world. Located at the crossroads of several trade routes from the 2nd millennium B.C., Aleppo was ruled by many different empires. In spring 2013, it was reported that the minaret of the Great Mosque of Aleppo had been destroyed during the fighting. Palmyra contains the monumental ruins of a great city that was one of the most important cultural centers of the ancient world. During the Syrian civil war, fighting has caused several of the columns to collapse. Additionally grave robbers have stolen numerous objects from Palmyra’s tombs. If you are one of the few holdouts that refuse to believe the earth’s climate has changed in the recent past, take a look at the arctic. The Polar Regions contain strong visual evidence to support the idea that the earths average temperature has risen by 1°C since 1880. The thickness and extent of the polar ice sheets are becoming significantly smaller. You don’t need to be a climatologist to observe the latest satellite imagery to see the obvious decline in ice sheet coverage. Routing a ship through the Northwest Passage (NWP) requires insurance. There are many dangers ships encounter while sailing through the passage. These include: icebergs, channel depths, whale migration patterns, environmental impacts. Insurance can increase up to 30%. Sailing the Northwest passage can save traders both time and potential revenue. Navigating from western Asia to the eastern U.S. requires passage through the Panama Canal. The canal has a depth limitation so bulk cargo ships can not utilize the full potential of their ships carrying capacity. Moreover since the canal is located in Central America, the distance saved using the NWP is significant. 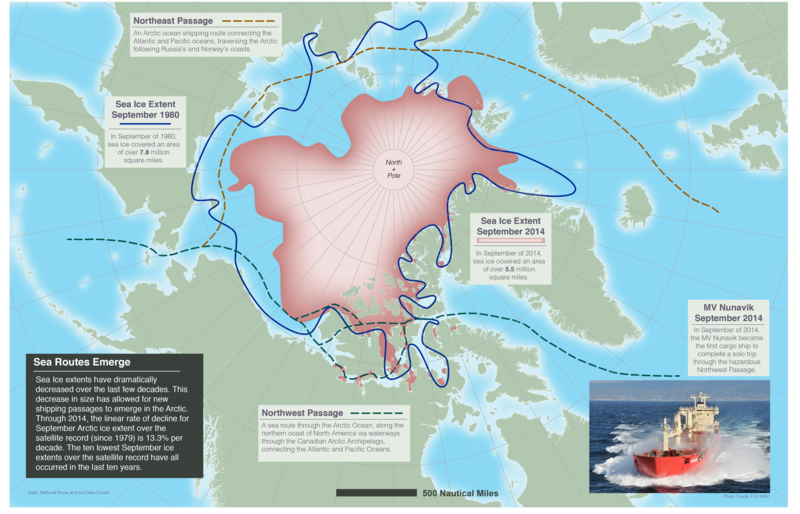 Even though the Northwest Passage is entirely within the territorial waters of Canada, the U.S. and various European countries maintain they are an international strait and transit passage, allowing free and unencumbered passage.